More than 400 exhibitors across 123 exhibition stands were in attendance at the NRW Forum event hall in Düsseldorf, representing over 600 dance companies, choreographers and dance institutions from 58 countries. Seventy-two companies and solo artists contributed to the performance program, which comprised 54 full-length performances as part of the main program on stage and 24 performances from the “Open Studios”, Site-Specific Performances. The program was presented in 11 of the best performing-arts venues in Düsseldorf, Krefeld, and Leverkusen. 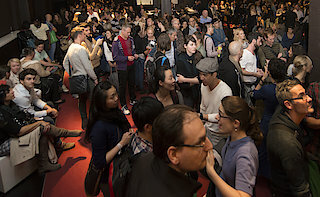 Approximately 1,600 registered dance professionals made the most of the opportunity to gain valuable business insights, network with others and experience the diversity of contemporary dance productions live on stage. If you wish to learn more about the internationale tanzmesse 2014, please check our Archive section!